Most of us are familiar with the concept of the Mediterranean diet. For decades it has been upheld as one of the best ways to eat for heart health and general longevity of life. Now, studies also suggest that the Mediterranean diet can reduce the risk of depression, especially among people with type II diabetes. While the mechanism is not yet fully understood, it is thought that the diet lowers levels of inflammation in the body. Inflammation has many negative effects, one of which is that it reduces the secretion of a brain compound called neurotrophic factor. In people with depression, levels of this brain compound are lower than normal. 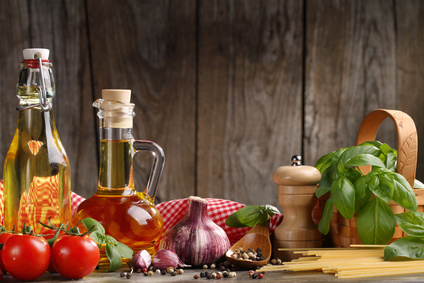 The Mediterranean diet consists of plenty of fruits, vegetables, grains (typically whole), olive oil, beans, nuts, legumes, seeds, spices, and herbs. It also includes regular consumption of fish and seafood, moderate consumption of poultry, eggs, cheese, and yogurt, and occasional consumption of red meat and sweets. In addition, it emphasizes the importance of enjoying food with family and friends, as well as the importance of physical activity. Make plant-based foods the main part of your meal. You could try eating hearty salads with beans and roasted vegetables, or brown rice and stir-fried vegetables. Include fish in your diet at least once each week. Seafood is an excellent source of healthy omega-3 fats, and is a wonderfully nutritious protein source. Broiled tilapia, baked salmon, or grilled shrimp are excellent options. Add beans and legumes to your diet. They are a great low-fat source of protein, and are rich in potassium, magnesium, and iron. You can throw garbanzo beans into your salad, black beans into your rice, or cook up some lentils and mix them with goat cheese and beets for lunch. Cut down on salt by using spices and herbs to flavor your meals. Sit down and enjoy your food with family and friends. Sanchez-Villegas, A., Martinez-Gonzalez, M. A., Estruch, R., Salas-Salvado, J., Corella, D., Covas, M. I., … Serra-Majem, L. (2013). Mediterranean dietary pattern and depression: the PREDIMED randomized trial. BMC Medicine, 11, 208, doi:10.1186/1741-7015-11-208. Skarupski, K. A., Tangney, C. C., Li, H., Evans, D. A., & Morris, M. C. (2013). Mediterranean diet and depressive symptoms among older adults over time. J Nutr Health Aging. 17(5), 441-5, dpi: 10.1007/s12603-012-0437-x. Previous Post: « What is Disordered Eating and Why Should We Be Worried About It?